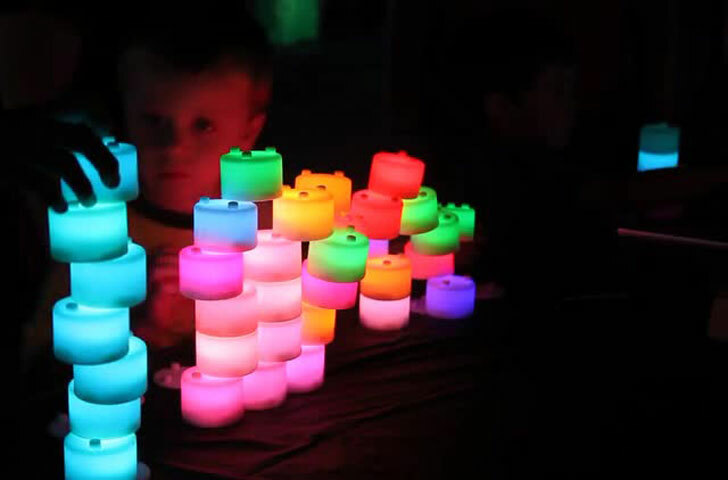 There’s something about glowing, colorful lights that fascinate children, regardless of age. Combine the beauty of illuminated hues with the fun of building blocks, and you have a toy that can keep both adults and kids occupied long into the evening. Created by Brooklyn-based designers Emily Webster and Mustafa Bagdatli, Tangeez are recyclable, circular plastic building discs that use LED lights to create a wide combination of colors. Tangeez are comprised of the same plastic used in milk jugs and contain three LED lights (red, green, and blue). Each disc has three prongs on the top, and three holes on the bottom. Powered by a coin-cell battery and only 2.5″ in diameter and 1.5″ tall, Tangeez are portable and able to be moved throughout the house or taken along on a trip. Individual blocks do not function on their own, but once blocks are stacked together they can produce up to seven colors based on their configuration. Connecting one prong produces one shade, depending on which hole is chosen. The more prongs that are connected, a greater variety of hues are achieved. The modular units are designed to help improve a child’s hand-eye coordination, spacial skills, and act as ambient lighting. They are available in four kits via their Kickstarter campaign, ranging from a Mini to Double Stack. A minimum pledge of $45 secures three of the pieces, and a base plate. Tangeez are working on establishing their injection-molding process here in the US, and have already been recognized in a number of New York Maker Faires for their efforts. There's something about glowing, colorful lights that fascinate children, regardless of age. Combine the beauty of illuminated hues with the fun of building blocks, and you have a toy that can keep both adults and kids occupied long into the evening. Created by Brooklyn-based designers Emily Webster and Mustafa Bagdatli, Tangeez are recyclable, circular plastic building discs that use LED lights to create a wide combination of colors.